Why Do Cats Need a High Protein Diet? 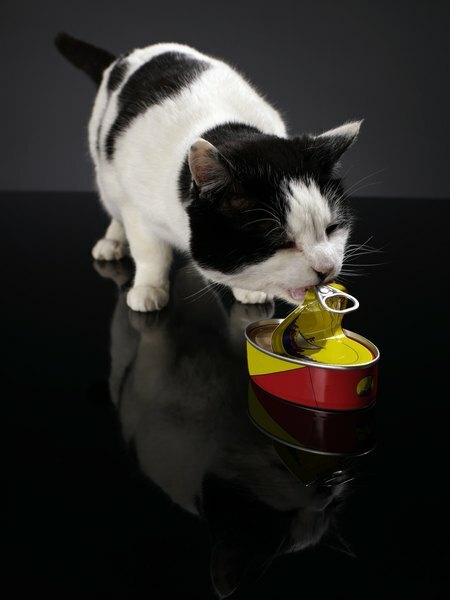 Canned cat food tends to be higher in protein than dry cat food. Like their relatives in the wild, house cats are obligate carnivores, which means they have to eat meat to survive. Meat is high in protein, which is critical to Kitty's good health. Although she can't exist on meat alone, protein is the foundation for many of her dietary needs. Protein forms the building blocks of the body's tissues and organs, as well as skin, hair, blood, muscles and tendons. It's also made up of amino acids, which are necessary for regulating metabolism and repairing and growing tissue. Cats absorb amino acids and use them to create new proteins or provide energy for other bodily processes. If certain amino acids are missing or insufficient, Kitty's body is not functioning as efficiently as it should. For example, taurine is a critical amino acid in protein. Cats who don't have enough taurine in their diets can have serious health problems, such as blindness and heart problems. Although everyone needs protein, cats have a higher protein requirement than many mammals, including the family dog. 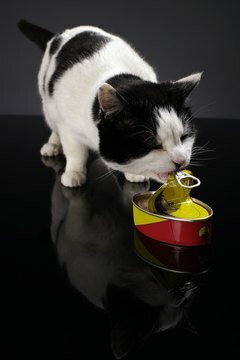 A cat's metabolism breaks down amino acids at a higher rate, which means she requires more protein in her regular diet. Other animals' bodies can adjust their rate of protein breakdown, but cats can't. If Kitty has a low protein diet, her body's metabolism will still respond to a higher protein diet. FAB Cats recommends that 25 percent of Kitty's daily calorie intake be protein. Many commercially prepared cat foods rely on plant-based sources, such as grains and vegetables, to provide protein in the diet. However, cats don't process protein derived from plants as effectively as they do animal proteins. It's becoming more common to refer to "high-quality" protein in cat foods. This doesn't mean that the food is organic or uses exotic meats, but instead means that it's an animal-based protein source. Canned food, which tends to be meat-based, is considered high-quality protein. Many dry foods aren't because they often rely on plant-based sources to comprise much of the protein in the food. In foods that have primarily plant-based protein sources, a chemically derived taurine supplement is added to the food to ensure it meets cats' special dietary needs. Where your cat is in her life will determine how much protein she needs. Nursing queens and kittens need higher amounts of protein to help ensure the kittens' proper, healthy development. It's also important that cats continue to get plenty of protein as they age. In his veterinary blog Insights Into Veterinary Endocrinology, Dr. Mark E. Peterson notes that it's very important for cats over 10 years old to get high-quality and sufficient protein because they don't absorb and metabolize protein as well. He notes that energy requirements increase sharply for older cats and if their caloric intake is not increased, they'll start losing weight, partly because they're losing muscle mass. Dr. Peterson estimates that at least 50 percent of a geriatric cat's diet should be comprised of protein. If you're figuring out what to feed your cat, don't be confused by the protein percentages in dry food versus canned food. The dry food may contain higher percentages of protein, however, because it's based on weight, it's like comparing apples to oranges. Wet food usually contains more protein compared to dry food. Also, look at the protein source. If the dry food contains lots of grains and soy, it is a good bet that much of Kitty's protein will be coming from plant-based protein sources instead of the preferred high quality animal-based sources. If you are concerned that Kitty isn't getting enough protein, talk to your vet about her specific needs to make sure she's getting the right balance of protein from proper sources. What Kind of Tuna Is Used in Cat Food? How Much Protein Do Cats Require? What Are the Benefits of High-Protein Cat Food?